In the previous Quick Start chapter we published our first map. 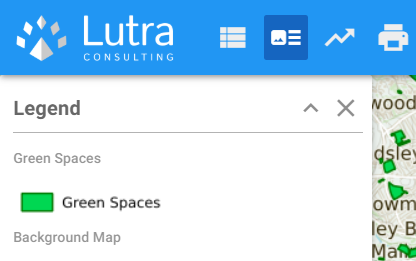 In this chapter we’ll learn about styling published maps and will make the background maps less busy and assign a sensible style to our green spaces data. In order to change the styles of the layers in Mappin, we’re going to change the way they look in QGIS and then upload the project again. Let’s start with those background maps. The background map layer, OSBackgroundMaps is a WMTS layer (tile-based maps). To QGIS it’s still a raster layer and we can overrride how raster layers are displayed. We’ll tone down the colour (hue) in the layer to make the foreground maps stand out better. Now with the layer properties open we can change the way the backround maps are displayed. 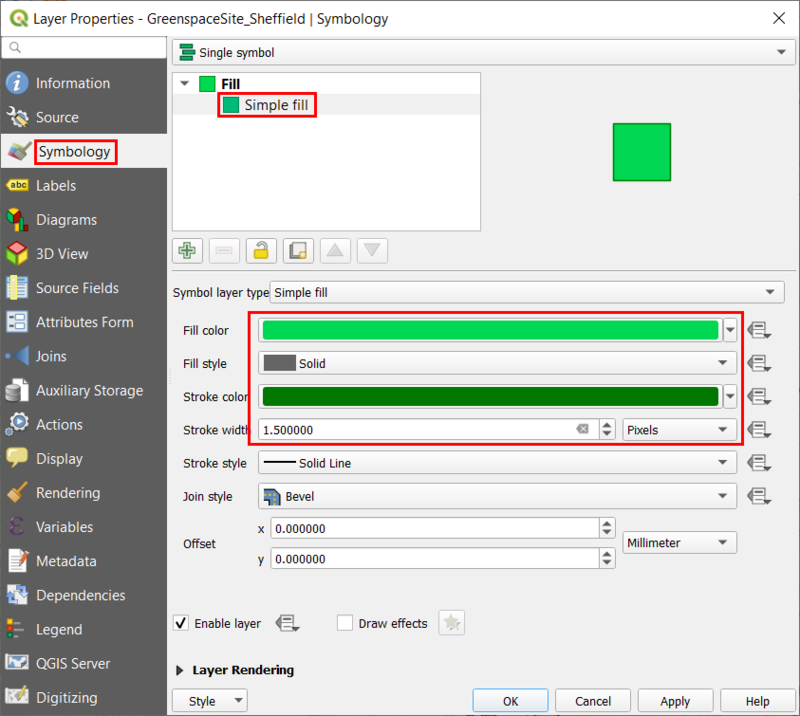 As QGIS loads vector layers with random colours, your green spaces may not be green. We’ll change that now - making them green with a dark green outline. Please note that measurements in styles and labels in map units or mm may not look the same when published using Mappin - this is because QGIS is most likely displaying the maps on your computer in a different DPI setting than the one used in the WMS standard. Using measurements in pixels should mean the maps on your screen will look the same when published in Mappin. Now we’ve updated our QGIS project, let’s upload it to Mappin (FIXME). With our updated project uploaded, we expect that our published maps will now reflect our recent changes, having lighter background maps. You may have noticed that this is not the case and (in at least soem areas) the map still looks the same as it did initially. This is because Mappin has cached some of the map tiles (stored tiles it’s already drawn on disk so it can simply re-send these later when requested rather than having to draw them again). We’ll now temporarily disable this cache so we can effectively preview the new map styles. 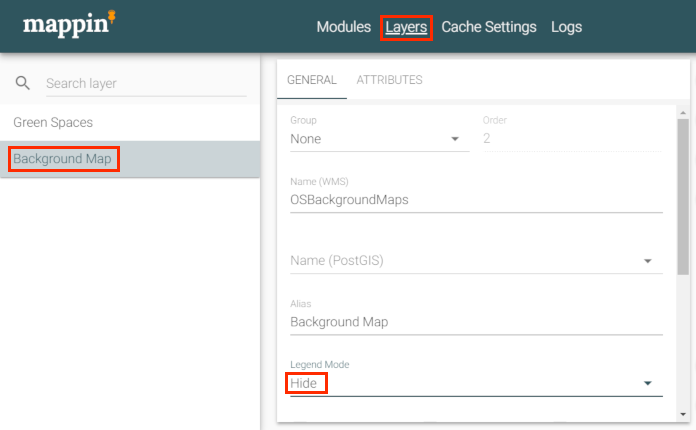 default_view_cache is a Cache that’s created automatically by Mappin based on the layers that are visible by default and aims to improve performance of initial map loads. We’ll learn more about caches laster. By changing the Disable Storage option, Mappin will no longer cache the default view (meaning we should see our updated styles). Now we can see our maps looking as we wanted them to. Although Mappin supports caching of layers, support for seeding (pre-populating) or dropping/invalidating a cache have not yet been implemented. For these reasons, cached map tiles in Mappin have a lifetime of 24 hours after which time they expire (are deleted). This should provide some balance between performance (having the ability to cache tiles) but also being able to update layer styles. Where you would normally invalidate / delete a cache, in the current Mappin release, you just need to wait 24 hours for the stale cache tiles to expire. Please note that we also disabled caching for the default_view_cache cache above - we’ll leave this off for now and will experiment more with cache settings in later chapters. Notice the background maps also have an entry there - we’ll now disable legend images for the background mapping layer as it’s not really appropriate to display one. The legend should now only display an image for our green spaces layer. The same setting we just used to hide legend images can also be used to specify an uploaded image file to use for a layer’s legend image.